Heather of Mock On points to yet another contextual advertising oddity, of which there have been many, alongside news coverage of hurricane Katrina. 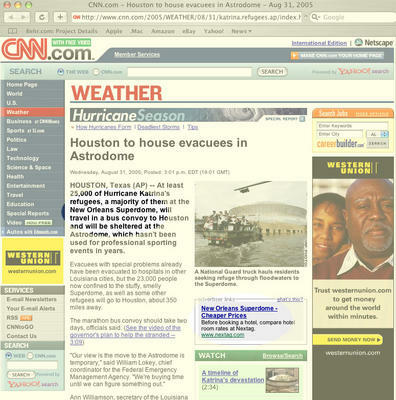 Heather took a screenshot of a CNN story about hurricane refugees living in the New Orleans Superdome being bussed to the Houston Astrodome. Alongside the story appears an ad for price comparison site Nextag with the headline, "New Orleans Superdome - Cheaper Prices." While the ad itself may not be all that offensive, it's not like anyone's going to be using Nextag to travel to New Orleans anytime soon. 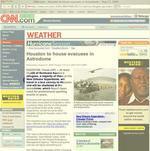 This too happened on SFgate.com after the plane 2 recent plane crashes. They were running ads for airline travel to various destinations. Um....I am not particularly thinking "let's go somewhere on a plane" while reading this type of story. Targeting me while reading this, just irritated me. I contacted them and let them know...and noticed shortly that not only was the airline ad pulled, but so was any ads running next to this tragic story. Even though I am in advertising, I don't think ANY ad should be running next to, on top of, really tragic stories. It ends up leaving such a negative taste in my mouth. Like do you REALLY need to hock that widget next to stories/pictures of people dying? Maybe it's just me. Grab a pen, a pencil or your brush, and help the victims of Hurricane Katrina rebuild their lives! We can do it, We can Help! Charity is about money, if you are an artist pick up a pen and lend your talent. Project HeART is asking artists from tattooists to painters to pick up a 4�x6� index card and give heART! Design a realistic heart, paint a sacred heart, sketch a traditional heart- whatever your style may be, combine your amazing talent with that of other great artists to help the victims of Katrina who have lost everything. We are gathering works of art into one large piece for a charity auction on eBay, with all profits going to Habitat for Humanity. Don't have an index card? Or prefer working on another material? Any 4�x 6� paper will do! Your contribution is more appreciated than you will know! Include your name, website, company, or other information you want attached to your work. Also send your email address to be made aware of the upcoming auction! Let us know you're participating! Email ProjectHeART@hotmail.com for more information or to sign up! Unfortuantely there was also contextual ads that talked about visiting new orleans. There needs to be monitors at these companies that visit these sites to ensure that these things do not happen -- because its extremely unpleasant, and not funny.